a growing interest in cars by my little one made me think that it would be cool if he had a street playmat. i browsed around etsy for some handmade ones but none really caught my fancy. 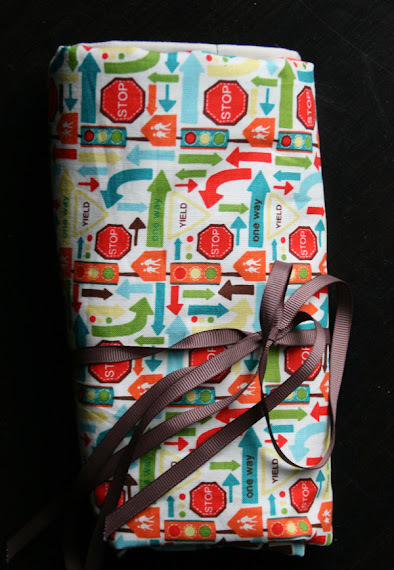 i have to say the most awesome handmade playmat i found was this one on homemade by jill. it's so cute, full of detail with all the personal touches of actual places. but she herself says that it was a labour of love and i very quickly dismissed the idea of making something similar within the next months. some more googling brought me to this great tutorial. it was truly not easy to find that riley blake fabric, but i finally found some in a dawanda shop here in germany. 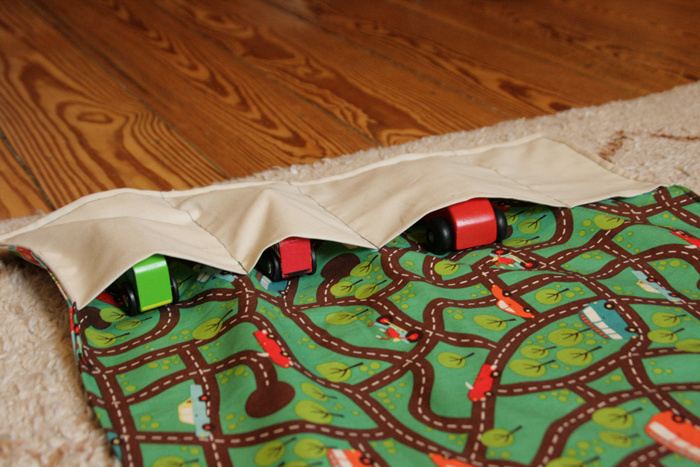 even though the streets are a bit narrow for most of the cars, it's stil the perfect fabric for a project like that. i used a coordinating riley blake pattern for the back. i adjusted the pattern/tutorial a bit according to our needs. our little one has a few bigger cars, so i made the pockets (or garages, as we call them now!) in different sizes. also, instead of the hairband and button to close the rolled playmat i simply used a long piece of ribbon. perfect for our upcoming overseas trip! this is a very nice playmat! 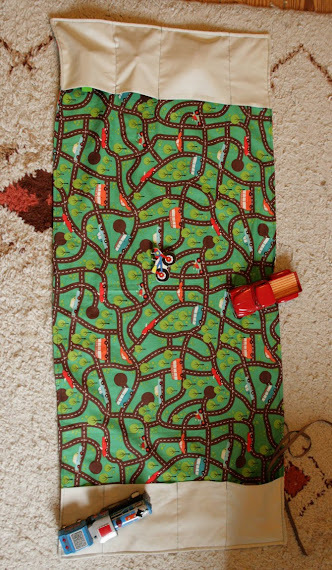 do you remember the most fun thing for me that our neighbor boy had was a street mat, i loved driving up and down the streets with toy cars. i'm sure this mat you made will be fun for many years. those little garage pockets are very cool. i can imagine them being used just as much as the roads will be. great idea! I made Finn a pair of pants out of the top fabric. I love it, and we always get compliments. that is such a cute idea! I remember my brothers had one of those play carpets and they loved it. A portable one is so much better! this idea is faboulus! makes me wish that my girl was more into cars than cats.